For years, the satellites of America's Global Positioning System have been carrying sensors that measure the weather in space. The information has been kept by the military, which manages the satellites, because solar storms and other space weather can damage satellites. Today, as the result of an executive order signed last October, the government released 16 years of that space weather data to the public for the first time. "It's really an unprecedented amount of information," explained Marc Kippen, a program manager at Los Alamos National Laboratory, where the sensors were designed. 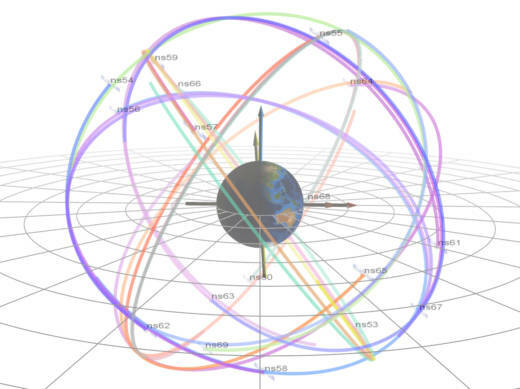 Twenty-three of the more than 30 U.S. military GPS satellites carry space-weather sensors, which measure charged particles in Earth's magnetic field and together provide 92 measurements every day of the radiation around the planet. Space weather is all about radiation. The National Oceanic and Atmospheric Administration publishes regular updates on three types of space weather: geomagnetic storms, solar radiation storms and radio blackouts. All three can disrupt satellite operations and distort navigation systems. But the raw data from the satellites has not been made public. Within the military "there's a general hesitancy to broadcast even fairly innocuous things out to the broad community," Kippen told the journal Science. An executive order signed by President Obama changed that, requiring the information to be released on the grounds that space weather events have the potential to cause catastrophes down on Earth, meaning the information is relevant to the broader public. "Extreme space weather events — those that could significantly degrade critical infrastructure — could disable large portions of the electrical power grid, resulting in cascading failures that would affect key services such as water supply, healthcare, and transportation. Space weather has the potential to simultaneously affect and disrupt health and safety across entire continents. Successfully preparing for space weather events is an all-of-nation endeavor that requires partnerships across governments, emergency managers, academia, the media, the insurance industry, non-profits, and the private sector." An example of space weather causing disruption occurred in April 2010. A Los Alamos National Lab press release notes a large magnetic disturbance that month, "resulted in a communications failure, causing a satellite to uncontrollably drift in space and presenting a hazard to nearby satellites." "Currently, scientists are unable to predict when these extreme events will occur, how strong they will be, or how severe the effects will be. The release of Los Alamos-GPS data enables new studies that will help answer these questions," the press release states. This is not the first time data gathered by military assets has proved to be more broadly useful, as NPR's Geoff Brumfiel reported for Nature in 2011. Soviet-era American spy satellites gathered photos of Earth that were later used for archaeological research. Military data collected in the 1970s and 1980s showed the thinning of Arctic sea ice. As of today, the GPS solar weather data has been released for all who might study it or use it to prepare for the next radiation storm. The information is available through the government data portal www.data.gov with the search term "GPS Energetic Particles." An overview of the data was also published today in the journal Space Weather.